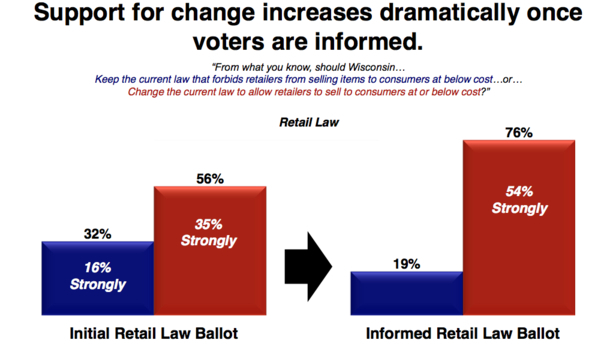 [Madison, Wisc…] A new poll shows that 56 percent of likely voters in Wisconsin support repealing the state’s minimum markup law. Support increases to 76 percent when the voters learn more about the law, formally titled the Unfair Sales Act. Public Opinion Strategies conducted the survey from Nov. 2-5, 2015, polling 500 likely voters with a margin of error of + 4.38 percent. The poll indicates that support for changing the law cuts across partisan, ideological, and regional lines in the state. The more voters learn about the law, they more likely they are to oppose it. They are also more likely to feel passionately about the issue with increased knowledge, with 54 percent indicating that they feel strongly about wanting the law changed after learning more. Individuals were most responsive to arguments that stressed the increased prices which result from the Unfair Sales Act. That number fell slightly to 80 percent when they were told that “Wisconsin residents are required to pay more for many on-sale items than residents in neighboring states simply because of this seventy-five year old law.” Seventy-nine percent reported themselves as unfavorable to the law when learning about its effects on Black Friday and back-to-school sales. Gene Ulm, a pollster at Public Opinion Strategies, said that the results of the poll were clear. As the MacIver Institute has previously reported, the minimum markup law bans retailers from selling merchandise below cost. Supporters of the law say that it’s necessary to protect small businesses from the Wal-Marts of the world, arguing that without the law, those small “Mom and Pop” stores would close. Those in opposition argue that other states fare well without the law, and savings are passed on to consumers. In one example, the MacIver Institute obtained advertisements from Wal-Marts in the Chicago, Milwaukee, and Minneapolis areas. On products ranging from DVDs to school supplies, Wisconsin consumers would pay up to 150 percent more than Illinoisans or Minnesotans. The MacIver Institute spoke with Senator Leah Vukmir (R-Wauwatosa) when she introduced a bill to repeal the law. The minimum markup law, which has been in place since 1939, dictates that companies who set their prices too low can be fined up to $500 for the first violation and up to $2,500 for each subsequent violation. Price markups range from 3 to 9.18 percent, depending on the product. Meijer, a Michigan-based chain, recently made headlines when it opened its first Wisconsin locations. Several complaints were filed with the Department of Trade and Consumer Protection (DATCP), alleging that items had illegally low prices. Items affected by the law range from gasoline, alcohol, and medications, to food items such as milk and beans. Wal-Mart has a $4 generic prescription drug program which offers low-cost medication to consumers across the country. Wisconsin is exempt from that program because of the minimum markup law, and consumers are forced to pay more. Sen. Vukmir and Rep. Jim Ott (R-Mequon) introduced Assembly Bill 452 (AB 452), which would repeal the Unfair Sales Act, back in October. So far, the hearing has yet to be scheduled for a public hearing in the Assembly Committee on Small Business Development.